The night I created these scrumptious drinks we were heading to a friends housewarming party on the North side. They had bought a beautiful place and I can't wait to go back for movies in the backyard! The weather was teetering on fall, but yet one of the last summer nights nice enough to pull off my ankle wrap sandals. The drink really lends itself to a crisp fall day or a snowy holiday / hot tub drink- they are warming, rich, slightly spicy, comfortable and downright delicious. Have them with a holiday brunch in place of a traditional mimosa or to kick off your evening of cheer. Tips and tricks: Use whatever pear is your favorite variety. Peel off the skin and cut the pear into pieces before roasting it, it's much simpler than attempting to do this after the pears are roasted. You can use champagne, prosecco or cava- whichever you prefer. My preference is for the latter two. Preheat oven to 375 degrees. Place above ingredients in aluminum foil, close up the foil and bake in the oven for about 1 hour. Blend until smooth. Thin with a little apple juice if the mixture is too thick (it really becomes quite similar to baby food texture). You can blend it by hand if you prefer a chunkier texture. Chill. I like to add a few cloves to the mixture while it's cooling- just be careful not to put them in the glass. 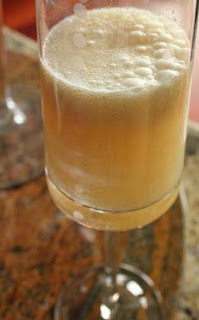 Place 1 or 2 scoops of the roasted pear mixture in the bottom of your champagne flute. Add champagne, prosecco or cava. Stir slightly, and top off with more bubbly. Enjoy.